In the previous section, we introduced the Phillips Curve, which is the Keynesian theory that there is a stable trade-off between inflation and unemployment. We also explained how the Phillips Curve is derived from the aggregate supply curve. The short run upward sloping aggregate supply curve implies a downward sloping Phillips curve; thus, there is a tradeoff between inflation and unemployment in the short run. In this section, we will explain how a neoclassical long-run aggregate supply curve will imply a vertical shape for the Phillips curve, indicating no long run tradeoff between inflation and unemployment. What Causes the Phillips Curve to Shift? We observed that the Phillips Curve relationship seemed to fall apart when the curve began shifting during the 1970s. How can we explain what happened? Economists have concluded that two factors cause the Phillips curve to shift. The first is changes in people’s expectations about inflation, and the second is supply shocks, like the Oil Crisis of the mid-1970s, which first brought stagflation into our vocabulary. Let’s explore each of these reasons. Milton Friedman, the founder of Monetarist Economics, a Neoclassical perspective, explained the first factor. He pointed out that there may be an apparent tradeoff between inflation and unemployment when workers expect no inflation, but when they realize inflation is occurring, workers demand higher wages, and the tradeoff disappears. Robert Lucas, a prominent New Classical economist, described this as an epiphenomenon, that is a statistical mirage. Starting from full employment (what economists call the natural rate of unemployment), an increase in aggregate demand causes a movement up the short run aggregate supply curve, raising the price level, while increasing real GDP and thus reducing unemployment. When workers realize prices are rising, they raise their inflationary expectations and demand increased wages to compensate for the higher cost of living. Increased wages cause the short run aggregate supply curve to shift up, with the result that we end up with higher inflation, but with the same (natural) rate unemployment as when we started. Watch the following video to see how this is explained graphically. Watch this video to see how the long run, vertical Phillips Curve is derived from the long run, neoclassical aggregate supply curve. Figure 1(a) shows the vertical, long run AS curve, with three different levels of aggregate demand, resulting in three different equilibria, at three different price levels. At every point along that vertical AS curve, potential GDP and the rate of unemployment remains the same. Assume that for this economy, the natural rate of unemployment is 5%. As a result, the long-run Phillips curve relationship, shown in Figure 1(b), is a vertical line, rising up from 5% unemployment, at any level of inflation. Figure 1. 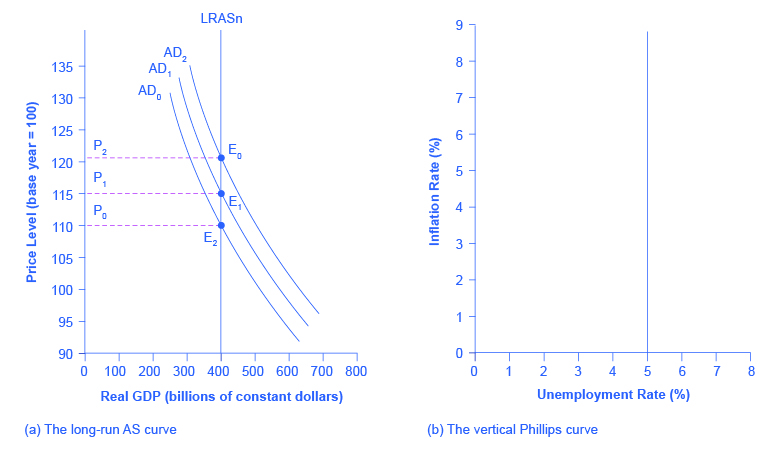 Neoclassical View of the Philips Curve. (a) With a vertical LRAS curve, shifts in aggregate demand do not alter the level of output but do lead to changes in the price level. Because output is unchanged between the equilibria E0, E1, and E2, all unemployment in this economy will be due to the natural rate of unemployment. (b) If the natural rate of unemployment is 5%, then the Phillips curve will be vertical. That is, regardless of changes in the price level, the unemployment rate remains at 5%. Traditional Keynesian economics did not account for the possibility of supply shocks, that is shifts in the short run aggregate supply curve. A negative supply shock, like a significant increase in the price of energy, causes an upward shift in AS, which raises prices, and reduces GDP raising unemployment. In the long run, unemployment returns to the natural rate, while inflation is at a higher level. Thus, both factors (changes in inflationary expectations and supply shocks) cause the Phillips Curve to be vertical with no long run tradeoff between inflation and unemployment.